If you or someone you know suffers from snoring or sleep apnea, treatment will improve overall health. It is well known that certain medical conditions such as high blood pressure, heart disease, depression, anxiety, headache, Type 2 diabetes, weight gain, adult asthma, and acid reflux are associated with sleep apnea. Non-medical associations include the risk of increased car accidents and relationship issues. Treatment options include a Positive Air Pressure (PAP) machine, oral appliances, nasal or throat surgery, tongue reduction surgery, and weight loss. This article will focus on CPAP and Oral Appliance therapy. A CPAP machine is a Continuous Positive Airway Pressure machine and is the most commonly used treatment for Obstructive Sleep Apnea (OSA), but many people are unclear about what exactly this machine does. 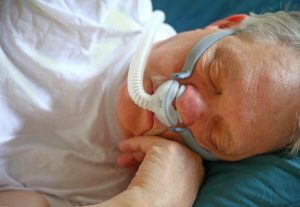 A CPAP machine provides patients with a constant flow of pressurized air at a setting specific to the needs of the patient to splint the airway open to eliminate collapsing tissues that cause sleep apnea. A CPAP machine is composed of three main parts: the motor, the hose, and the mask. The motor is a small compressor that draws in air and pressurizes it to deliver the correct air pressure to the obstruction in the airway. A motor means the machine must be very loud, right? In reality, the CPAP motors are very quiet, and often people find the soft noise to be soothing while falling asleep. The next part of the CPAP, the hose, is the transport apparatus that delivers the newly pressurized air from the motor to the mask. Once the air reaches the mask, the patient can breathe it in and through the obstructed airway. Masks come in a variety of shapes and sizes to ensure comfort since every person’s face is designed a little differently. While CPAP machines are the most common treatment for sleep apnea, many patients find they cannot tolerate the machine. Often patients complain of dry mouth, nasal irritation, acne breakouts, and allergy-like symptoms. Each person is unique and may experience different effects of treatment. There are two main types of people with sleep apnea: overweight persons who generally do well with a CPAP machine and are encouraged to lose weight, and normal body weight persons with facial deficiencies such as an overbite, crowded or missing teeth, or a lower jaw set back. The latter may be candidates for other types of treatments, including oral appliances. A custom-made oral appliance helps to position the lower jaw forward, increasing the size of the upper airway during sleep, and in turn reducing air resistance. Boil and bite molded products such as SnoreRx and Zyppah also position the lower jaw forward. Reducing this resistance helps prevent snoring and treat sleep apnea. These appliances fit like an athletic mouth guard or an orthodontic retainer. Many people find that oral appliances have numerous advantages, including being comfortable, portable, easy to wear and care for, and quiet. So, how does a patient know if a custom-made oral appliance will work for him or her? 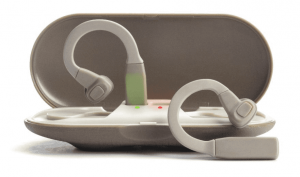 According to the American Academy of Sleep Medicine, oral appliance therapy should be the first line of treatment for snoring and mild to moderate OSA. There are more than 100 oral appliances approved by the FDA, so a dentist’s expertise is needed to obtain the correct appliance for a patient’s given conditions. The process to obtain an appliance can be simple, involving only a few visits to the dentist. It is recommended to seek a dentist with additional training in oral appliances. At the first visit with the dentist, a clinical evaluation will be given, including an oral exam and often x-rays. 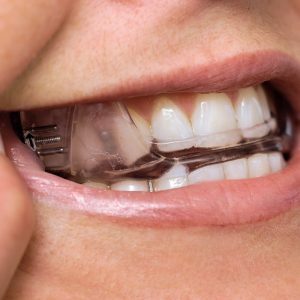 If an oral appliance seems to be the best course of treatment, physical or digital impressions will be taken to create models of the patient’s teeth. These models will be utilized in a dental lab to create the custom-made appliance. After the appliance is built, the dentist will then fit and adjust the appliance with the patient to ensure comfort and efficiency. Follow-up visits to the dentist are required throughout the treatment process to ensure the continued effectiveness of the appliance. A sleep study with the oral appliance is also recommended to check the appliance efficacy. Many people that undergo oral appliance therapy find that their symptoms and overall quality of life improve. Often people sleep better throughout the night and have more energy and attentiveness during the day. Some side effects are common and include tooth discomfort, jaw and muscle discomfort, tooth movement, and bite changes. However, most patients find these negative side effects minor compared to the positive changes they experience. Since snoring can be a nuisance and a sign of potential sleep apnea, and sleep apnea can be life-threatening, speak first to your physician or dentist about treatment options to improve your health, and possibly your bed partner’s health as well!